There are certain phenomena that happen so predictably they have become ordained laws of nature. For example, we know gravity will always bring things back down to earth, and the sun will rise each and every morning. Similarly, eating large amounts of sugar will make us crave even more sugar—or that's what it seems like at least. According to Darby Jackson, co-founder of Après and health and wellness coach, there's actual science to back that up. "People can be biologically addicted to sugar in the same way that they can be addicted to drugs or alcohol," she says. This might explain why statistics on sugar consumption are so staggering. A report from the University of California San Francisco explains that the recommended daily sugar consumption is no more than six teaspoons, or 25 grams, though the average American consumes 19.5 teaspoons, or 82 grams, per day. Fortunately, sugar isn't a necessity, and it can be easily removed from our diets (and lives and consciousness and kitchen cabinets) if we have the right mix of nutritious foods to keep us full and satisfied. Keep scrolling to see the foods and meals you should eat in order to successfully complete a sugar detox. 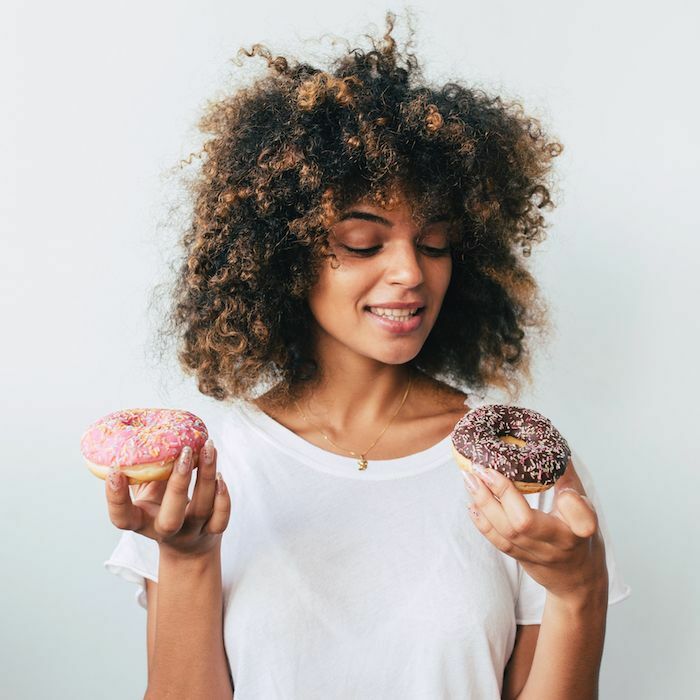 First, it's good to know we're not lacking in self-control or willpower when it comes to sugar cravings. "Our biological addiction to sugar comes from primitive neurochemical reward centers in our brains that light up when we consume sugar," Jackson explains. "These reward centers used to help keep us alive by signaling to our bodies that we need to eat more sugar to put on fat and stay alive when food was scarce. Now, food is everywhere yet our bodies are still programmed to consume sugar when we see it." To counteract this natural response, Jackson says "it's important for us to set our bodies up to control these cravings through a healthy diet and lifestyle." But that doesn't mean quitting sugar all at once. Lauren O'Connor, MS, RD, and owner of Nutri-Savvy, says "Start by recognising how much sugar is in the food you are currently eating. Read the labels, look for 'hidden sugars' and stick to more whole foods. Then wean yourself off by consuming less of the breads, crackers, chips, and even energy bars, some of which are practically candy bars in disguise." Consuming less sweet and processed foods is the goal, but she cautions against depriving yourself entirely. "Although it can be tricky, you’ve got to stick to your plan. Cold turkey may be easier in the short term because your body isn’t responding sugars’ incessant and nagging effect on the brain and the body, but in most cases, deprivation can lead to an unhealthy relationship with food, and in some cases binging." Jackson agrees that slow and steady is best for a lifestyle change, and it all starts with the first meal of the day. "The easiest way to start is by adjusting just your breakfast for an entire week," she says. "Focus on foods in the morning that are high in quality protein as well as healthy fats as these foods will keep you fuller longer, suppress cravings but give you energy." She recommends eating whole scrambled eggs cooked in coconut oil, which will provide both that necessary healthy protein and fat (as a bonus it's super easy and quick to make on early work mornings when we have zero motivation). O'Connor similarly recommends a veggie-filled omelet with shredded cheese, though her favourite is a yogurt parfait. Just be sure to use plain unsweetened yogurt and a low-sugar and high protein granola. Then, sprinkle in some nuts, seeds, and berries. For lunch, keep up with the protein, fiber, and healthy fats combo. "The best way to detox from sugar is to make sure that you are consuming protein and healthy fats. Protein will keep you feeling fuller longer and can also help reduce cravings while healthy fats like coconut oil and avocado will help stabilise your blood sugar and give you the energy you need to power through your day," Jackson says. Try preparing a colorful salad that's topped with beans, quinoa, or lentils and drizzled with olive oil. It has the nutrients your body needs and will give you sustained energy all afternoon long (so you can avoid that 3 p.m. slump that usually requires a cup—or two—of coffee to escape). Your lunch break is also a good time to check in with your hydration levels. Water is important to the body's metabolic processes and also helps keep you feeling energised and alert. Plus, it might prevent you from breaking your sugar detox to scarf down one of those conference room donuts. "When a person sees a sweet treat such as a glazed donut, pleasure signals are triggered in the brain," O'Connor explains. "The mind is a powerful thing. Simply seeing something pleasureful can elicit a desire. However, drinking water can delay your response and give you time to evaluate whether or not it’s a good choice to consume (or if just a bite or two will do)." Dinner follows breakfast's and lunch's suit. It's, again, all about a vegetable-based meal that includes protein and healthy fats. "You can certainly include whole-grains such as brown rice and quinoa, but limit (don’t restrict) the bread intake and other refined starches," O'Connor reminds us. Try a roasted vegetable medley with a serving of wild salmon, avocado, and brown rice. It's still warm and filling on cold fall and winter days, but without the extra calories and unhealthy fat that comes with other winter-favorite meals, like cream-based soups and starchy pasta dishes. Start with a base of cruciferous vegetables like spinach and Brussel sprouts before adding carrots, sweet potato, broccoli, or radishes—all of which can be roasted in olive oil. Top it off with a freshly prepared salmon filet and some avocado. We don't know about you, but that sounds so appetising, so filling, and so satisfying. As far as snacks go, whether you eat them before or after dinner, be sure to avoid hidden sugars says O'Connor. "There are hidden sugars in many of our packaged convenience foods. And often many of these don’t necessarily take particularly sweet. Take some wheat breads for instance, they may contain barley malt and other 'sugars' such as honey to balance the flavour, but we don’t consider this dessert." Also be aware of drinking too much alcohol. It's less satisfying than food but still adds a lot of calories to our day with its hidden sugars. "Not only that," O'Connor says, but "alcohol impairs our judgment so we tend to eat 'more freely' as opposed to sticking to moderation." Aside from packaged and processed foods and alcohol, also avoid eating too much fruit. Jackson says it can have negative effects on the body and encourage more sugar cravings. "There is a place for a little fruit in everyone's diet and isn't something that should be completely cut out, but too much fruit can be very detrimental to your body," she says. "It's packed with sugar, especially in juice form, and is just setting your body up for an insulin crash. Be mindful when you pick up a 'green juice' and check to see how much sugar is in the bottle. If you are going to eat fruit, aim for lower sugar fruits like berries, which are also packed with other nutrients." As for what you should eat for a snack, Jackson recommends vegetables with hummus, a small handful of raw nuts or seeds, or something similarly free of added sugars and preservatives. Next, see seven wellness commandments that fitness gurus want you to know before the holidays.